Not all indoor rowing machines are created equal. Some will deliver better health and fitness results than others depending on how they suit your needs. There is a rich variety of them, some that are sleeker and more highly-refined and others that are less so. So, you’ll want to know what to look for when shopping for a rowing machine. In this guide, we present a selection of top rower picks that are at the high end of the spectrum in terms of quality and value for money. We give you the lowdown so you can make informed purchasing decision when you finally hit Amazon. Concept 2 Model D Indoor Rowing Machine with PM5 Monitor has everything you need for a smooth and powerful total body workout. It is an easy to store machine that separates into two pieces for stress free storage and transportation. It features caster wheels that promote easier and enhanced mobility of the machine even when fully assembled. This indoor rowing machine features an innovative flywheel design that effectively minimizes noise produced during your workout while also ensuring there’s an even, smooth feel in the process. It consists of the Performance Monitor 5, a bonus that provides an accurate and comparable data for each row. This Performance Monitor sets the Concept2 Indoor Rower apart from other rowers and training devices of the same class given its level of sophistication and ease to use. The monitor provides precise data that’s comparable for every row. You don’t have to move closer to the display as it has a backlight that illuminates it and increases visibility so you can use it even at night. It also has an adjustable monitor arm which you can use to position the display where you most prefer. Another important highlight on the Concept2 Model D indoor rowing machine is its adjustable monitor arm that is designed specifically to promote a comfortable setup for every user depending on their arms and body sizes. The rower is fitted with adjustable footrests. These can be adjusted to comfortably accommodate just any foot size. It also has a comfortable 14-inch high seat that suits any body size, and a nickel-plated chain. There is also an ergonomic handle for ease of handling. This handle is designed to ensure easy and strain-free rowing at all times, best for the more demanding workouts. This 500-pound capacity machine comes with a full 5-year frame warranty and requires footprint of 9 by 4 feet. One particularly outstanding thing about the Concept2 Model D Indoor Rower is its practical design and sturdy frame. It’s a machine you can depend on for nearly your every fitness need from the comfort of your home. And with its sturdiness, one machine might just be enough to serve you for a lifetime so you can save on fitness costs in the long run. With the machine’s spiral damper, you can easily adjust the airflow to the Model D flywheel. This way you can always adjust how the stroke feels to deliver your desired preference. With minimal noise coming from the flywheel, you can comfortably work out early in the morning without worrying about waking up the kids. If you are living in a rented apartment where neighbors are close, this machine will ensure you don’t run into problems with angry neighbours. You may love to know that its Performance Monitor 5 technology is compatible with USB and flash drives. This makes it a breeze to capture, transfer and store your workout data, in addition to being able to monitor your heart rate wirelessly. Compared to a yearly gym membership fee, this machine is extremely cost effective, trading at the price of $945.00 on Amazon.com. Not to mention the luxury of being able to train at any time of day or whenever you feel the desire to do so, given the fact that it’s a home equipment. The combination of the well positioned footrest, high seat and ergonomic handle makes the rowing on this machine a perfect full body exercise without putting any sort of strain on some parts of the body. You realize that going about rowing improperly can break your spirit to proceed with the exercise. In essence, these features are positioned in a way that promote easier coordination of all the moving body parts, spreading the impact evenly across the body without overworking some parts. What’s more, the machine itself requires very little maintenance other than regular wiping to clean it. You can expect it to remain in perfect physical condition with great aesthetics several years down the line If you are looking to get a real solid piece of equipment for your fitness and daily exercise at an affordable cost, then the Model D rowing machine is the perfect pick for you. Therefore we’ve picked this as our best rowing machine of 2017. The BodyCraft is a commercial grade rower with a powerful heavy-duty aluminum track that you can trust to stand up to the most intense workouts and withstand the heaviest body weights. This powerful construction is apparently the reason why BodyCraft, the equipment’s manufacturer offers a lifetime warranty for this machine. This equipment is fitted with an easy-to-read Black Mask LCD w/LED screen with a backlight and keys. It has an electronically controlled resistance system, the Air and Eddy current magnetic resistance with up to 32 levels. With this kind of resistance, you can you can be sure to find your ideal resistance level for training. 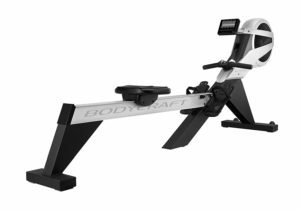 BodyCraft’s VR500 Commercial Rower utilizes a dual resistance technique: both air and magnetic resistance are used to provide you with such a broad range of resistance. This machine has been designed to put the controls in your hand with and eliminate the need to stretch yourself to manually reach its controls. It has remote resistance settings in the handlebars so the user can perform everything without having to leave the seat. BodyCraft has also used on the VR500 Commercial Rower a computer system with up to 12 pre-programmed workouts on its resistance settings. Four of these programmed workouts target the heart zone, another four of them are race profiles and two are interval training programs. The VR500 Commercial Rower also comes with a deluxe heel rest that is adjustable by use of its Quick Adjust foot straps. With a T13 aluminum heavy duty I-beam mono-rail in its frame, this machine is by far a lifetime investment. The proven strength is a guarantee that you are putting your money into something that will provide unending value for the rest of your life. You won’t worry about your kids accidentally getting hit by the folded VR500, thanks to its child safety lock. It’s also easy to fold and roll so you won’t feel its weight when moving it around. Even more amazing is the quickness with which you can fold this machine for storage. It has been optimized to be folded for storage in just about 3 seconds. BodyCraft’s VR500 commercial rover is truly a product of high end technology particularly on its resistance system which incorporates the latest in machine technology. Whichever way you look at it, the VR500 commercial rover is one of the most premium rowing machines ever made. The handlebar is made of ergonomically correct Aluminum material and is skillfully crafted to provide a comfortable grip. The 4 button IR remote resistance controls are carefully positioned for ease of use. Its rollers are friction free and bearings are industrial grade and ultra-smooth, not to mention that the handlebar has wireless resistance controls for maximum comfort during your exercises. Along with the contoured seat that has been optimized for comfort, the machine offers a typical VIP experience inside your very own home while you work out. Easy to Read Black Mask LCD w/LED Backlit Display and Keys. Electronically Controlled Air and Eddy Current Magnetic Resistance with 32 levels. Ergonomically Correct Comfort Grip Aluminum Handlebar with 4 Button IR Remote Resistance Controls. Deluxe Adjustable Heel Rest with Quick Adjust Foot Straps. Heavy Duty I-Beam Mono-Rail made with High Strength T13 Aluminum. Easy Fold and Roll System with child safety lock. Folds for storage in less than 3 seconds. This handcrafted rowing machine features a water flywheel expertly designed to replicate an actual rowing experience. This patented design not only emulates the feel a boat going though water, rather, it also effectively simulates the physical and functional benefits of rowing a real boat. The flywheel is set inside an enclosed water to produce a quiet and smooth, self-regulated resistance. This machine has a solid Ash wood construction that absorbs both vibration and sound, making it perfect for use in high-traffic areas including commercial gymnasia, rehabilitation clinics and studios. The Ash wood is popular for its sturdiness as a premium hardwood and can carry up to1,000 pounds of weight. It has incredible dimensional stability and longevity. In addition, the machine has four wheels at each corner of the rails. These increase its seat stability. The frame flips upright easily for convenient storage. Another interesting feature of the WaterRower Club rowing machine is its black and rose stain finishing with a trace of Danish oil and urethane which protect the wood. There is a Series 4 performance monitor on the WaterRower Club which is technically sophisticated but very user-friendly. It comprises three navigation buttons, six different windows for information and programming and another six QuickSelection buttons that work together to track the intensity of your workout, display your heart rate, stroke rate, zone bar, distance you’ve covered and the duration taken. The monitor comes with an optional chest strap and heart rate receiver that you can choose to use to enhance your workout. Even though workouts with rowing machines are always intended to provide the same benefits as actual rowing in a water body, most rowers tend to be jerky with a jarring feel. As such, few rowing machines ever come close to creating the intended experience. 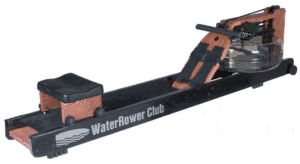 In this regard, however, the WaterRower stands tall above other rowing machines. It delivers a smooth, natural feel with its flowing movements that do not exert undesirable pressure on the joints. This makes the WaterRower a perfect aerobic tool. This commercial-quality cardio machine is great for boosting the heart rate. With its two paddles inside an enclosed water tank, the water flywheel provides a smooth resistance comparable only to that of an actual water body. Really, if rowing the WaterRower Club is not fun then I wouldn’t tell what is. It is pleasure to use the machine and it is perhaps one of the few gym equipment that are pleasure to use. This mechanism has many benefits. For starters, it creates a self-regulating type of resistance that eliminates the need use a typical jarring motor. The system is one where resistance increases with increased drag that naturally occurs when you paddle faster. So the more you can overcome drag the more you can row – in a smooth fluid environment. Additionally, the machine lacks moving parts that would require lubricating or otherwise wear out with time. Needless to say, this mechanism means the WaterRower Club rowing machine is easier to maintain and could last for a long time without a hint of change in the experience it offers. This is a high end cousin of the Concept2 Model D (reviewed earlier on). This model features a robust frame 20 inches high and a nickel-plated chain designed for smooth riding. It features a durable double powder coat and a lustrous finish. Though this product is a step up from the Model D, the Concept2 Model E Rower features the same PM5 Performance Monitor available with the other model, but with a slightly longer arm. Its handles are ergonomically designed to deliver safe and optimally rewarding workout experience. It also comes with adjustable foot-rests so that any user can find their best workout settings. 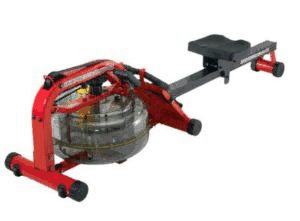 Its flywheel design is a slight adaptation of the lower-cost model D, but notably more efficient. You’ll also realize that the Concept2 Model E Indoor Rowing Machine with PM5 has a much higher seat compared to the Model D. Model E’s seat is raised 20″ high, towering over that of the other model by a whole 6 inches. This additional height is designed for the benefit of athletes who have mobility or balance concerns. This additional height can let them get on the machine and off easily with less effort. This machine has a fully enclosed chain housing to keep its nickel-plated chain safe and clean. Its frame consists of a 54-inch aluminum rail and a stainless steel track on which the rower’s seat moves during use. The Model E also has a Spiral Damper with settings adjustable from 1 to 10 that you can use to control how much air enters the housing of the flywheel upon each stroke. The Concept2 Model E Indoor rower is robust equipment with welded steel legs that can support virtually any body weight without problems. It comes up on the higher end of the price spectrum but the value is really worth the cost – you can have one machine for the rest of your life. That’s a lifetime of saving. The machine’s ergonomic handle effectively promotes natural hand and arm positioning while working out so the exercises don’t take a toll on you. This is further enhanced by the exceptionally high seat with a height of 20 inches. So if you have a knee problem or mobility issues then you don’t have to shy away or keep from working out at all. This machine has the kind of high frame that has got you sorted out. For storage, you’ll love the Model E rower. It separates easily into two parts that takes a very minimal space while out of use. When you are ready for your workouts, you can have the equipment fully assembled quickly with its tools and instructions that come with it. It’s equally easy to move the machine around the room or from one room to another with its nicely curved caster wheels. Since you can control how much air gets into the machine’s flywheel using the Spiral Damper settings just like a bicycle gear, it becomes fun to seamlessly control the amount of energy you must exert to accelerate from stroke to stroke. With the kind of enclosed design of the nickel-plated chain found on the Model E, there’s much reduced need for oiling compared to the one on Model D.
There are a couple of features with the Newport Adjustable Resistance rower that make it a truly amazing pick. Included is a tough polycarbonate shell water tank with a stainless steel paddle inside it. This triple-bladed paddle serves as smoother alternative to the mortar that other traditional rowing machines normally use. The water volume in this rower can be varied between 9 and 17 liters so you can enjoy rowing at your preferred water level for optimum rowing experience. The little computer attached to this machine displays time, the distance you cover, a 500m split time, stroke count per minute, calorie count per hour, the number of watts and interval training. Additionally, you can opt to read your heart rate with its optional heart rate reception unit. This machine comes with an ergonomic handle that effectively prevents strain on your hands, wrists, and arms. This means you can safely make rowing a daily activity without accumulating undesirable pressure on your wrists or hands. 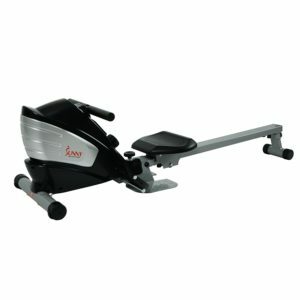 The belt drive in this rower is durable with a smooth, quiet operation so you are not subjected to any whirring sounds. Overall, the machine has a solid, sturdy construction that makes it a perfect addition to your home gym. If you have experimented with a real boat then you won’t find any other rowing machine that can mimic that same experience as effectively as the First Degree Fitness Newport Adjustable Resistance Water Rower. Rowing on this machine is completely fluid and feels just as it would with an actual boat in the water. 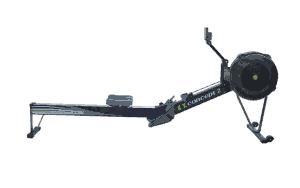 It has zero jarring and maximum resistance created by the triple-bladed paddle and fluid resistance technology. The resistance here is just perfect. 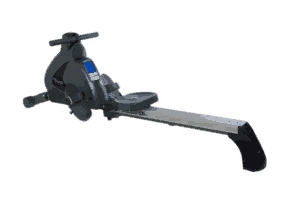 Few competing rowers can offer the same resistance as the Newport. So Quiet You Can Exercise Any Time of Day! I particularly love the fact that I can adjust the water level to instantly adapt into a fiercer workout from an initial light warm-up. Notice that with the water, the harder you row the more intense the exercise becomes. This mechanism inherently regulates the intensity of your workout in a cool and rather natural way. What’s even more motivating is that you can exercise at any time of day without rubbing your neighbors the wrong way or waking up a sleeping kid. The noise is absolutely minimal and the sound produced is smooth and hushed. You also get to experience no irritations as the resistance is one of the smoothest there can be in a rowing machine. From an economic standpoint, this ergometer has a robustness that guarantees value for your money as a worthy investment. Users of all levels of fitness, ages, genders and body types can enjoy working out on this machine and realize their best rowing results. Fluid resistance technology Water ? nature?s perfect resistance. More resistance than most single resistance level competitors. Ergonomic handle Designed to prevent strain on the arms, wrists, and hands. Durable belt drive Smooth, clean, quiet (no whirring noises), and built to last. Solid construction makes this perfect for home gym applications. This machine comes with 12 workout programs to help the user diversify their exercises in terms of variety and intensity. Included in these12 workout programs are 6 cardio profiles and 1 heart rate program to build up your heart rate, 4 custom user programs and a single manual to guide you through your workout process. The LCD monitor on this equipment is backlit so that you can read your workout feedback at any time, even at night without the need for additional or alternative lighting. This keeps the user motivated by tracking time spent, distance, calorie count, number of strokes per minute, pulse rate and the wattage. The display monitor is easy to use with intuitive up and down arrows for adjusting workout time as well as resistance levels. Included is a chest strap that you can use to track your heart rate. The Stamina Avari Programmable Magnetic Rower is what many users will consider user friendly – judging from its intuitive In-Touch® Fitness Monitor with 12 programmed workouts to the simple assembly, the foldable construction and the easily movable design that makes storage a walk in the park. The machine is budget friendly and just measures just the right size for smaller spaces. I also love the minimal noise produced by the machine. You can use it safely without worrying about bothering a noisy neighbor. 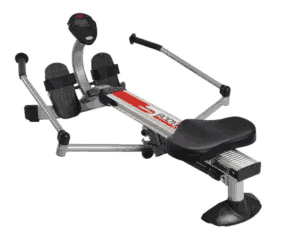 Also, with the many levels of resistance, the machine lets you row at the most preferred or appropriate level of resistance. And since it can fold up into a pretty small size, you can comfortably keep the folded Stamina Avari Programmable Magnetic Rower inside a closet without problems. Though this is a personal rower, it may as well pass for a commercial grade rowing machine. It is heavy and sturdy enough to stand high traffic and will serve you for long without losing value. You can choose to use the optional chest strap can during any of the 12 programs that can be easily monitored using the In-Touch® Fitness Monitor. My chosen preference with the optional chest strap however is the heart rate program. For those cardio enthusiasts, this is certainly a great pick: with its 7 preset programs featured, this workout machine will automatically adjust its magnetic tension to maximize your cardiac training with no interruption. And any user will love the seat. It is really comfortable and moves smoothly along the aluminum beam. This smooth movement significantly enhances the ease with which you perform each stroke. For indoor rowing, the Stamina Avari Programmable Magnetic Exercise Rower is a top pick. Glider 1050 is a home rowing machine with compact footprint measuring 23.5inches by 46 inches and an adjustable gas-shock resistance. Being adjustable, the gas-shock resistance provides room for any user to set the most appropriate level of intensity for their abilities. The Body Trac Glider has been designed to offer maximum convenience in terms of the amount of space it takes up. Its frame is less extensive which means you can conveniently work out with this machine in a relatively small room without worrying about the walls or other items in the room. In practice, the BodyTrac Glider can fit into just about any living space to satisfy your workout needs. It is also low cost which means it can fit into much smaller budgets. The Stamina Body Trac Glider 1050 Rowing Machine features a sturdy, steel frame construction that guarantees longevity. In addition, it folds easily for storage and similarly unfolds fast so you can set it up in a split second for your exercises. The Glider 1050 has 12 levels of resistance so you can choose the one that most suits you. It features a small computer that shows the time taken in during the exercise, stroke count, and the amount of calories burned in the process. With this monitor, you can know the exact number of complete rows you have performed, along with the amount of time spent performing them; how much calories you have burned; or a quick scan through the three. This machine is quite inexpensive considering its robust frame and computer system. Though the foot straps tend to be a bit loose sometimes, the foot rest is always comfortable. It is not only sturdy but also broad enough to accommodate the various foot sizes any user is likely to have. 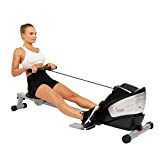 You’ll however love the fact that this Stamina Body Trac rowing machine is quite practical and lets you experience a full-body workout in a way that few other rowers can. You can target your arms, back and abs at the same time. With an easy to reach shock resistance knob, it is particularly simple to adjust your workout level during the actual workout process. It lets you make any changes on the level of workout at any point so you don’t have to leave the seat to do this. Also, the multifunction monitor fitted on the Glider 1050 is a handy tool that shows you all highlights of your workout on the go. The seat is comfy enough to provide the kind of comfort that will encourage frequent exercising on the machine. With its exclusive handle system, this rower offers a healthy all so desirable break from the regular handles positioned right to the front. LifeSpan’s RW1000 has a 16.5-pound flywheel in its Eddy Current Drive System for a smooth and quiet feel during your workout. The flywheel is designed to produce a fluid and smooth feel that mimics the experience of rowing an actual boat in water. It features a sturdy steel frame that can carry up to a maximum user weight of 300 pounds. This solid construction is backed by a five-year frame warranty, a 1-year labor warranty as well as a two-year parts warranty. It measures 90 inches by 18.5inches by 23 inches for its length, width and height respectively. When folded, the machine measures 34inches by 19inches by 64inches (Length, Width and Height respectively). These new dimensions promote space economy with the reduced size intended to fit seamlessly into just about any living space. The RW1000 is fitted with a three-LCD console where readouts for time, distance, calories, strokes and strokes per minute are displayed to give you virtually all the information you need for a complete body workout. The easy-to-use console is strategically positioned right in front of you so you can easily monitor the feedback as you work out. The rower requires no external power supply. Its console uses its own AA battery for its maximum convenience and energy efficiency. The quiet and comfortable nature of this rowing machine is something laudable. Unlike other conventional rowers that make noise all over the place and may easily turn you off with their jarring sound, LifeSpan’s RW1000 indoor rowing machine is smooth and quiet. You don’t have to turn up your background music during your workout. Thanks to its patented Eddy Current Drive System that’s responsible for the smooth and quiet resistance that remains cool even with intense workouts. Right below the display is a knob that controls its 5 levels of resistance. This ensures that you can conveniently select your best resistance level for the best workout results and make subsequent adjustments on the go. If you are looking for a rower that you can use without getting sore palms, then the LifeSpan RW1000 Indoor Rowing Machine is a great pick. The rower has padded hand grips so it won’t take a toll on your palms. Even more comfortable is the 14-inch injected foam seat optimized to comfortably support users weighing up to 300 pounds. Its large foot pedals are fitted with Velcro straps for a tight but comfortable grip. Additionally, they are designed to swivel as you use them to avoid taxing your ankles. For a rower in this price range, the RW1000 is a premium option. It comes with a modest price tag but delivers the same value as the more premium commercial grade rowing machines. This makes it a prudent choice whichever way you look at it. This rower has a distinctive magnetic tension system with 8 adjustable resistance levels to suit different users. There are the characteristic large dual function foot plates that essentially turn the rower into a powerful upper body machine. This targets the arms, upper back and shoulder and is perfect for performing a broad range of muscle-building workouts such as biceps and full arm exercises. Its anti-slip pedals are also fitted with adjustable foot straps for secure footing. The Sunny Health & Fitness Dual Function Magnetic Rowing Machine features a multi-function LCD display to help you track your workout time and strokes, monitor your total strokes and check calories in real time. This display does not however show the distance you have covered or your speed. Also, only one of the readings is displayed on the screen at a time – which is quite okay for a machine in its price range. The fully padded seat ensures your workout is a comfortable experience and not some kind of draining struggle. The machine has non-slip handle grips to increase friction between your palms and the handles. This lets you grip it with little effort so you can focus your energy on exercising the target body parts. Its transport wheels make it a breeze to move the machine around for convenient exercising. This rower has foldable parts that together with the built-in transportation wheels provide easy portability and storage. The machine can easily be disassembled for storage and reassembled whenever you want to work out. Magnetic Rowing Machine measures 70L by 20W by 19H, small enough to fit in a modest space. Additionally, it is robust enough to suit anyone weighing up to 300 pounds – making it a whole family workout equipment. The Dual Function Magnetic Rowing Machine is not expensive, and that’s a definite add for most home based gym equipment users. If you find a yearly gym subscription fee prohibitive because of its high figure, then you’ll want to buy something that doesn’t drain your pocket of cash. The Sunny Health & Fitness Dual Function Magnetic Rowing Machine offers you this advantage and still affords you the same leading quality and durability as its costlier cousins. Its large heavy duty foot plates are great for a dual function workout, allowing you to maximize the gains on more body parts: you may perform high impact bicep curls and upright rows, just to mention a few. Most users love the portability feature of the Sunny Health. Since it can be easily folded, transportation is much easier and effortless. You don’t have to use extra energy to lift the machine to transport it to any part pf your home. Just use the built-in wheels at the front of the unit to move it around or from room to room for storage. Being able to see your results on the Digital Monitor is another amazing feature as it can keep you motivated from day to day. You may be interested to know that this machine’s adjustable resistance feature is designed for easy access. The resistance dial is located right in front of you so you can easily adjust the tension during your workout. This is unlike other machines in its price range, that have the resistance knob hidden beneath the frame. FOLDABLE PORTABLE DESIGN: Transportation wheels for easy portability. Rower easily folds and locks into place for storage. Max user weight capacity 275lbs. This rower has a couple of amazing features that you may find appealing. Both the front bar and the back bar have rubber feet to protect your floor from unwelcome scratches or damage. This material also increases friction the machine exerts on the flooring so it won’t move while in use. The seat is designed to provide maximum comfort with its ample padding. The padding is also carefully selected to provide the desired friction between your body and the seat during workout. There are the Velcro foot straps that securely hold your feet while you are rowing. This rowing machine has removable pins on its frame. These allow for easy folding of the workout unit for convenient storage. 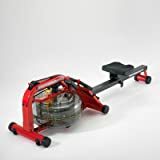 Additionally, its front bar has wheels with which you can easily move the rower from room to room or whichever part of your home you wish to keep it. Its console displays the number of miles you have covered, the count of calories you burn and the amount of time you spend working out. This rower’s console is powered by 2 “AA batteries (separate) and is significantly energy efficient. Stamina X Air Rowing Machine also has a comfortable padded handlebar optimized for safe grip so you won’t worry about hurting your palms while rowing. If you are looking to have a smooth gliding and a rowing experience that feels really natural, then you may want to consider buying the Stamina X Air Rowing Machine. This workout equipment is structured to cater to every user’s preferred intensity given its resistance system that adjusts to the desired level based on the effort you exert while rowing. The harder you row the more intense your workout becomes, so you naturally alter the level of resistance depending on your rowing ability. This way, you can easily perform your exercises at your preferred pace and maximize your gains. One of the most important features on this rower is the easy to read monitor which displays your workout speed, distance covered and time taken as well as the calories burned. With this workout feedback you can easily keep track of the kind of progress you are making each time you work out. The machine also comes with a sliding, upholstered seat that makes the whole workout a comfortable experience. The foot plates have a set of corresponding straps that can be adjusted to fittingly grip any size of foot. These footplates are also large with a textured strap that ensure your feet won’t slip off. For a newbie rower, this rowing machine is a great pick as the display has been designed for easy reading and less strenuous, more comfortable use. And given its affordability, just about any family can afford the Stamina X Air rower. Three-year frame warranty; 90-day parts warranty. Assembled size: - 77 long x 18in wide x 22in tall; Weight: 54 lbs. In conclusion, this low-impact exercise can just be as stimulating as other higher impact exercises. It is an effective way to burn calories and tone your body. Coupled with a healthy diet, rowing can significantly help with weight loss. 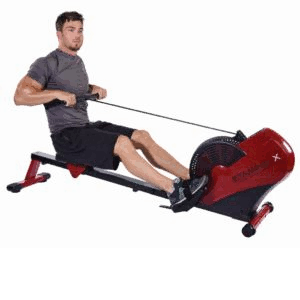 An ergometer (rowing machine) can burn up to 1000 or more calories per hour as it engages both the upper and lower body, the core and the back at the same time. And they have the added benefit of value for money; these machines cost less compared to many fitness machines. Whether you want to build some muscle or simply lose some weight, there’s no better way to go about it than by a full body workout. It increases your chances of becoming a healthier, more well-rounded athlete and eliminates the need to target a different part of the body in the gym each day of the week (which is such a tall order). A total-body workout can result in much greater cardiovascular and neuromuscular gains – and a rowing machine allows you to achieve this from home. Rowing eliminates the need to go to the gym. Let’s face it, many people skip the gym because of busy schedules that leave them with little time to spare for the fitness center. What if you didn’t have to visit the gym at all? A rowing machine is a great alternative as far as your cardiovascular workouts are concerned. It’s equally a way to strengthen most of the body’s major muscle groups from the comfort of your home. Ideally you want to max out on your saving without compromising on quality of the workout machine. Many people would want to go for the budget models. However, it’s important to do your homework on this area. Some of these low-priced models can often represent false economy. You might end up with a machine that’s either difficult to use or just does not deliver the desired workout. Do you have enough room? Indoor rowing means you’ll keep and use the machine somewhere within your home. You can’t keep the rowing machine outdoors; the weather can damage it. There has to be some space for it within your room where it can fit. What physical attributes are in play? How long are your legs? How strong should the material be? Depending on your own physical characteristics, you’ll need a machine that can support your body and weight. Overall, shopping for a rowing machine requires that you assess the available options in terms of their styles and features and how each of these affect your fitness needs. The high end machines definitely come with price. But you can still get great and reliable rowers without having to break the bank. From this list, it is apparent that there is a significant price difference between the rowing machines that made it to our top 10 picks. One, that reality may instantly make it clear to you that price isn’t the prime factor as far as the best rowers in the workout industry is concerned. Two, an endless array of unanswered questions may flood your mind regarding various aspects of these workout machines. All that notwithstanding, there’s one question that would certainly remain bothersome to a good majority of those who seriously wish to buy a rower based on this guide: how do I narrow down to just one pick from a list of 10? A rower, like any personal tool, is only as suitable as the individual who is using it. Before you settle for a purchase, it’s essential that you consider who will be using the machine. Then you can evaluate the suitability of the rower based on the personal attributes of the intended user to find which machine is best for them. For instance, if you have a knee problem, or issues with mobility, you could love any of the 10 rowers reviewed here. But only one will ultimately be able to suit you: The Concept2 Model E Indoor Rowing Machine with PM5. Its 20-inch high seat and exceptionally raised frame is likely to be your best option. 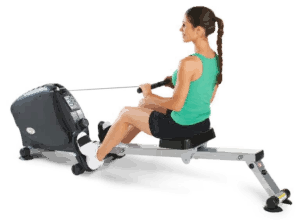 Overall, tall users would require rowing machines with long seat rails, preferably those that are higher off the ground. Their shorter counterparts on the other hand would be better off with rowers which have smaller seat rails. What do you wish to achieve from rowing: burn calories? Tone muscles? Build up your heart rate? Whatever your aims are will determine the kind of rowing machine to provide them. If your objective is to monitor and keep a record of a specific metric of your workout such as calorie count then you’ll have to pick a rower with the best monitor. Today’s main types of resistance options include air, water and magnetic. 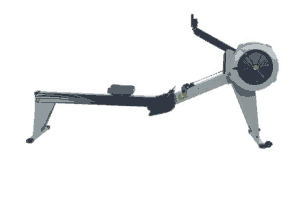 Depending on the mechanism of resistance, the rowers tend to produce different levels of noise. Nonetheless, rowers that use water as their resistance mechanism tend to be less noisy and more fluid, replicating a real boat rowing experience. Once you have settled on your preferred resistance mechanism then you can narrow down to just one or two rowing machines. At the end of the day, you can only buy a rower that you are capable of affording. Suppose you are not constrained by budget, chances are that the more expensive rowers are higher end as they are mostly made from superior materials with the latest technology included. As such they are more likely to deliver better value for money and better results overall. Once you identify the factor that best defines your best rower, your selection dilemma becomes a thing of the past; you can quickly scan the list and see the rower that meets your selection criterion.